Wooden Pen Set offered is highly demanded for its beautiful designs as well as availability in vibrant and immaculate finish. Made available with option of custom branding support, these pen set options bear handmade finish and can be offered in different exciting shapes and size options to pick from. VA- 021 Wooden Watch + pen set. - Engraving Where Available On Request. - Dimensions: 6" x 4" x 6". Wooden Key Chain & Pen Set available here. Ruler Theme Wooden box with two Metal Pens (Black Gold).Box Pen can be customised with company's name / logo OR individual names on the Pen. 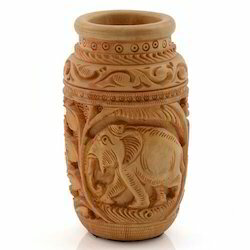 Intricately hand crafted Elephant Wooden Pen Stand ideal for corporates, festive gifts, desktop gifts. Elegant Metal Roller and ball pen set in gift box packing. - Can be laser engraved. Usage/Application: Office, Home, School, etc. DW 1026 is Wooden Pen Gift Set. Both are made from natural maple wood. for promotion it can be used and also for personalized gifting. We are a leading company, occupied in presenting a diverse series of Wooden Pen Set. Besides, our clients can avail this product from us at nominal prices.